RArm: RShoulderRoll - RShoulderPitch - RElbowYaw - RElbowRoll - RWristYaw - RHand. LArm: LShoulderRoll - LShoulderPitch - LElbowYaw - LElbowRoll - LWristYaw - LHand. Leg: HipPitch - HipRoll - KneePitch - Wheels: WheelFL - WheelFR - WheelB. See also: Head joints, and diagnosis keys on HeadYaw. See also: Head joints, and and diagnosis keys on HeadPitch. See also: Left Arm joints and actuators, and diagnosis keys on LElbowYaw. See also: Left Arm joints and actuators, and diagnosis keys on LElbowRoll. See also: Right Arm joints and actuators, and diagnosis keys on RElbowYaw. See also: Right Arm joints and actuators, and diagnosis keys on RElbowRoll. See also: Left Arm joints and actuators, and diagnosis keys on LHand. See also: Left Arm joints and actuators, and diagnosis keys on LWristYaw. See also: Right Arm joints and actuators, and diagnosis keys on RHand. See also: Right Arm joints and actuators, and diagnosis keys on RWristYaw. See also: Left Arm joints and actuators, and diagnosis keys on LShoulderPitch. See also: Left Arm joints and actuators, and diagnosis keys on LShoulderRoll. See also: Right Arm joints and actuators, and diagnosis keys on RShoulderPitch. See also: Right Arm joints and actuators, and diagnosis keys on RShoulderRoll. See also: Leg joints, and diagnosis keys on HipRoll. See also: Leg joints, and diagnosis keys on HipPitch. See also: Leg joints, and diagnosis keys on KneePitch. Joint angle (in radian) to reach. Exception: for hands, aperture (in percentage); 0 means closed, 1 means opened. if Stiffness > 0: the last position requested by a timed command. if Stiffness <= 0: the same value as the Position/Sensor. Hand aperture (in percentage) to reach; 0 means closed, 1 means opened. Rotation speed (rad/s) to reach by wheels. Stiffness of the joint (in percentage); 0.0 means 0% and 1.0 means 100% (full power). In the motorboard, this percentage is directly applied to the max current. Setting the Stiffness to 0.5 means that the electric current limitation is reduced to 50%. The Stiffness is sent to the motor board every DCM cycle time, so you can decrease/increase the control loop very fast. However, the current limitation may have some delay. If the Stiffness is <0, the motor is free (no electromagnetic break), but due to hardware limitation, it’s only possible when the two motors of the same board are <0 (both are then free). If not, it’s still electromagnetic brake, but with a security that disable it when there is some movement, to protect the mechanics. 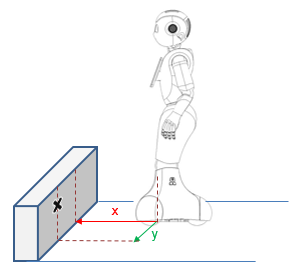 Stiffness may be automatically cut in case of problem (calibration, sensors …) seen at the DCM level or at the µc level, in order to protect the robot. Angle of the joint (in radian). The sensor used is a Magnetic Rotary Encoder (MRE), used like potentiometer. It’s a 12bits precise value (from 0 to 4095) change in rad. For further details, see: MRE. Hand aperture (in percentage); 0 means closed, 1 means opened. The sensor used is a Magnetic Rotary Encoder (MRE), used like potentiometer. It’s a 12bits precise value (from 0 to 4095) change in percentage (0.0 to 1.0). Rotation speed (rad/s) of the wheels. Every motorboard has a current sensor for each motor that is a shunt resistor. The current is an absolute value in Ampere. Every joint has an electric current limitation: if the current reach the “Max” value (“ElectricCurrent/Sensor/Max”) the PWM (return by the control loop) will be decreased a bit until it returns under the maximum value, and it’s increased again after. This is a kind of current control loop around the maximum value. The aim of this limitation is to protect the motor, the electronic board, and the mechanical part of the joint. The motor temperature is a sensor placed on the motor housing. The motor board implements a temperature limitation to protect the motor. The temperature limitation depends on robot version. The status is computed accordingly to the temperature limitation to protecting the motor. A non null value implies an automatic correction of the Stiffness. 1: means temperature has reach the max limit, start reducing stiffness. 2: means the joint is very hot, stiffness reduced over 30%. 3: means the joint is critically hot, stiffness value is set to 0. See also: Head tactile sensor, and diagnosis keys on Head. See also: Tactile Hands, and diagnosis keys on LHand. See also: Tactile Hands, and diagnosis keys on RHand. Touch sensors are capacitive sensors that return a 2 state float value 0.0 (unpressed) or 1.0 (pressed). Depending on robot version, hands sensors are either inactive, or only one is active. See also: Buttons, and diagnosis keys on ChestBoard. See also: Bumpers, and diagnosis keys on Bumpers. Switches are simple sensors that return a 2-state float value 0.0 (unpressed) or 1.0 (pressed). Beware that the value is read only every 10ms, and very fast change may be unseen. See also: Inertial unit specifications, and diagnosis keys on Gyroscope. See also: Inertial unit specifications, and diagnosis keys on Accelerometer. Theses are direct rotation speed values in rad.s-1 from the inertial sensor in the center of the body. The inertial board computes 3 inclination angles of the robot body with the gyro and accelero data. All angles are in radians. Theses are 3-axis acceleration in m.s-2 from the inertial sensor in the center of the body (one g is approximately 9.81 m.s-2) Depending the robot version, the precision is 8 or 12 bits. There are other deprecated values still returned. See also: Eye LED specifications, and diagnosis keys on Eyes. See also: Ear LED specifications, and diagnosis keys on Eyes. See also: Shoulder LED specifications, and diagnosis keys on ChestBoard. Unfortunately, having 3 RGB LEDs set to “1.0” does not mean that you’ll see a perfect white: one or two LEDs will be brighter than others. Chest LEDs are now located in the shoulder. See also: Sonar specifications, and diagnosis keys on Sonars. Continuous distance update from sonars, in meters. See also: Battery specifications, and diagnosis keys on Battery. Boolean: 1 if an obstacle is detected, 0 otherwise. See also: Laser specifications, and diagnosis keys on Lasers. The distances returned follow the robot’s coordinate system, with the position of the camera, projected on the ground, as the origin. Frames captured since the start of the robot. Rolls over after 65535. The operation mode determines which lasers are activated. All cards contain the operation mode 0 and 1. The operation modes 2-7 are only available in the front sensor, they cannot be activated on the left+right sensors simply because they only have a horizontal laser.